It may be futile to try to convince Gov. 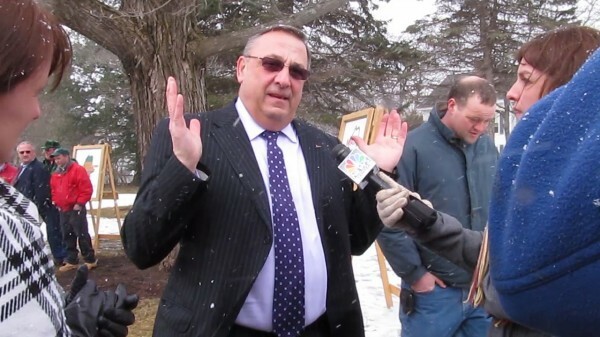 Paul LePage to release $105 million in voter-approved bonds. So far he has not listened to reasoned arguments, pleas or angry cries. He certainly showed no will to issue the bonds after Democrats on Thursday called for him to do so. But will he consider the flaw in his argument or be swayed by data from a nonpartisan group? His representatives have said the governor’s position is not based on the individual merits of the projects to be funded by the bonds, which include investments in airport and port improvements, downtown development initiatives, clean-water upgrades, conservation plans and investments in community dental clinics. Rather, they say, LePage will wait until the state’s fiscal situation improves to borrow the money. But we question that reasoning because LePage has also said he would release the bond money if the Legislature agrees to his plan to issue a revenue bond, funded by future earnings from liquor sales, to repay the state’s $484 million in hospital debt. The Legislature would also have to agree to a $100 million bond for the construction of a new prison, he has said. If LePage really wants to wait until it’s “fiscally prudent” to borrow, and wants to wait to issue new debt until bills are paid, then why is he proposing a deal contingent on more borrowing? Delaying bond issues could, if it hasn’t already, backfire on LePage and the state, as borrowing has the ability to spur development — particularly because the state has the capacity to issue bonds, has a good record of paying back debt quickly, and interest rates are so low. It would be great if the state had the cash on hand to fix roads and complete construction projects — which could aid business productivity and grow jobs — but that’s not realistic. The incredible need for a greater focus on long-term economic growth was made clear this week when the nonpartisan Maine Development Foundation’s Maine Economic Growth Council released its yearly report. The “ Measures of Growth in Focus” report highlights 26 signs of how Maine’s economy is doing. One indicator that received a red flag was the state’s poverty rate. In addition to the overall poverty rate — which increased to 13.3 percent in 2011, from 12.8 percent in 2010 — LePage should pay close attention to the completely unacceptable poverty rate for children: 24.2 percent for children up to age 5 and 19.3 percent for all children under 18 in 2011. Releasing bonds won’t come close to addressing the poverty levels, but it might provide jobs for parents who desperately need them and pump more money into an economy that is suffering. It is infuriating that political and ideological motivations are preventing the bonds from being issued when they have the ability to help the state’s long-term economic outlook.